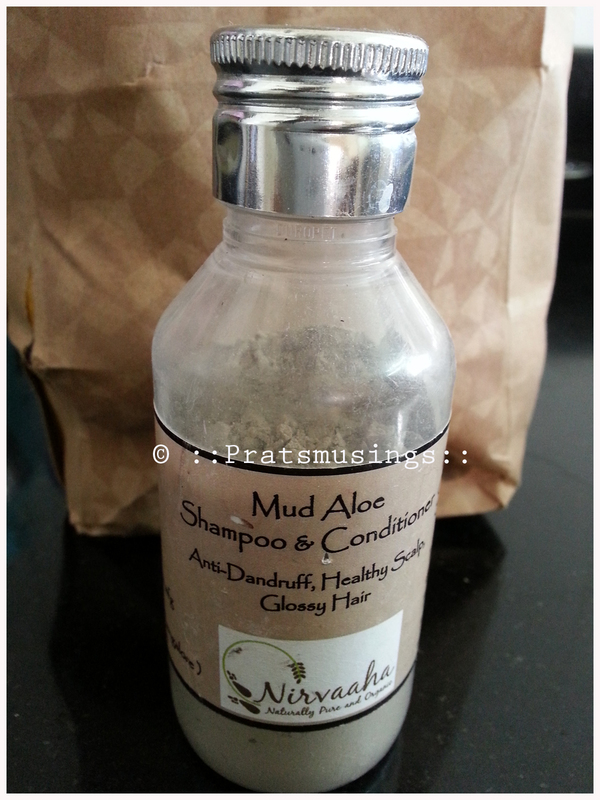 Correction, it is actually a mud aloe shampoo and conditioner by Nirvaaha. This came to me with a very high recommendation and with the earlier products that I had used from Nirvaaha, I was pretty sure that this would not fail my expectations. I have used their ubtans, soaps hair packs and the shampoo till now and as I write the list I am making a mental note whats pending a review. Coming back to the shampoo, it has no fragrance and it does not lather, so if you like either of these qualities in your shampoo, don’t buy this one. I picked this one because I was specifically looking for organic shampoos. The market in India is pretty limited when it comes to organic products and when you hear of a potential product, you know you want to try it. The texture of the powder is very smooth to the touch and I use about one heaped tablespoon for my hair length which is super short. You will need add water slowly to get the desired mix. I don’t like the paste runny, so I mix the paste to a slightly thick consistency. I like it that way because it makes it easier for me to massage into the scalp. The first time I used this I had oiled my hair and the results were ineffective. I had to use a shampoo to get the oil off the hair. So please keep in mind that this shampoo is ineffective when you have oiled your hair. The second time I used it as a shampoo, it dried out my hair completely because I used too much of the powder and I actually kept it for 20 minutes using it as a hair pack as against the mentioned 10 minutes. Post that, whenever I used it, I take a heaped tablespoon , mix it to the desired consistency, wet my hair thoroughly before massaging it and leaving it on for 10 minutes. The end result is fantastic. I have a lovely bounce and shine in my hair. It has not eliminated the dandruff issue that seems to have stuck on for the longest time ever, but it has reduced the itchiness and there has been a slight reduction in the dandruff. Priced at INR 150 for a 100 gm powder, it is inexpensive and You can view the range of products at Natural Mantra, Lady Blush, Box Tree, UnwrapIndia and CraftsVilla. You can also order from them,which is something I prefer because I get to chat with the owners and figure out what may suit me and what won’t and based on the recommendations I order for products. I will recommend this one because it is packed with everything natural and organic. But note that the results will not show in one wash, you need to be patient and use this at least a couple of times to have healthier hair. About Nirvaaha Mud Aloe Shampoo & Conditioner : Good Conditioning Shampoo for Dull, Damaged and Dry hair. It results in a healthy, dandruff free scalp and shiny bouncy hair. Mud Aloe Shampoo eliminates toxins, dandruff, bacteria and impurities from the scalp/skin. It improves the blood circulation in the top skin layer thereby making the skin healthy and fresh. It improves dull and damaged hair and imparts a shiny, bouncy look to hair. Clay and Aloe are high in nutrients that are good for both skin and hair. 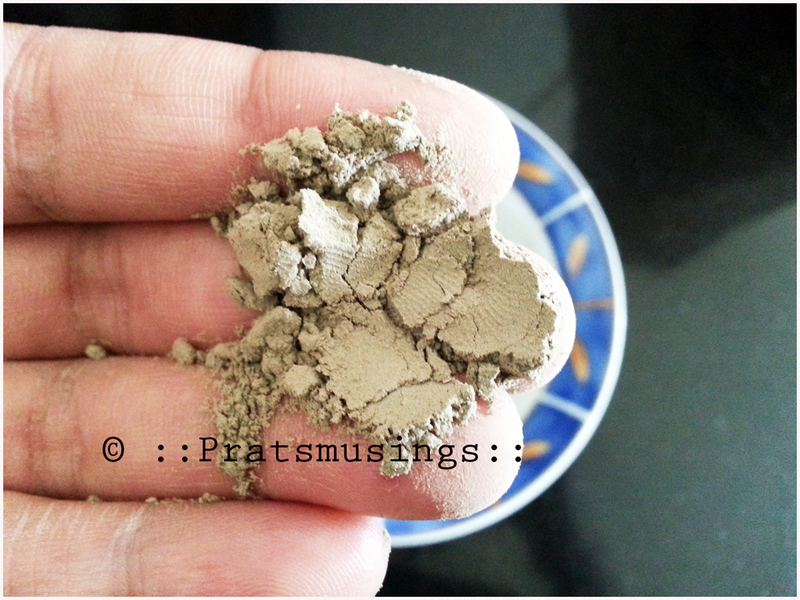 This Mud Aloe powder can be used as a shampoo and also as a face and body cleanser. 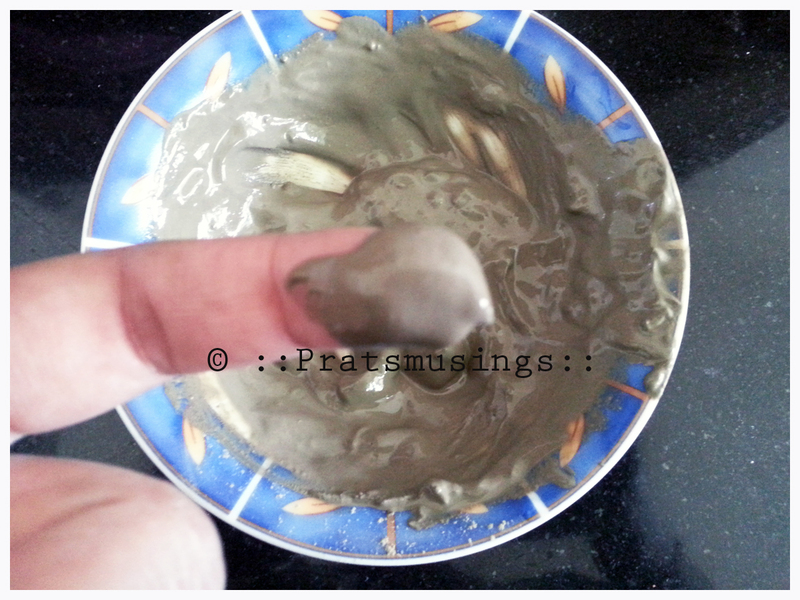 Ingredients: Nutrient rich Black Clay from the River-bed, Aloe-vera and Sarora. This products is free from Preservatives, Chemicals, Artificial Colors or Fragrances. How to use : Mix 1 tablespoon of Mud Aloe powder in enough water to make a paste. Wet your hair and massage the paste into your hair roots using your finger tips. Leave on for 10 minutes and then wash off with plain water. No need to use a shampoo. Avoid applying oil in your hair before using the Mud Aloe shampoo. This can be used on face and body also. For winters, it is a must to use a conditioner and a shampoo. I am yet to find a suitable organic shampoo for the winters. But no matter what I use, I condition my hair with Jungle by Lush. Jungle works wonders on my hair. And yes I do indulge in a lot of oil massages in the winter, so my hair is not so dry post a wash. I have not yet used this in the winter, so I am actually not sure how this will fare in that season. I use a SoulTree one too, I can’t recollect which one one 🙁 I use the Lush conditioner post the wash. And I oil my hair at least 4 times a week and leave it overnight, I can afford to cos I have super short hair. Hair-fall is common in winters. Use the shampoo in this season and check, if you still have hair-fall, then I guess the product does not suit you. Yea I’ll give it a try tomorrow. You see sometimes a shampoo doesn’t work for our hair type, but it may work in the next few months. And I attribute it to seasonal fluctuations. For that reason I always keep 2-3 varieties of shampoos/face washes with me ! :p Never got to try Lush , but I have seen its website. Most of its products have SLES , and other chemical stuff , but I guess they have organic range as well , which is again quite expensive. Do you massage it onto scalp , and then follow it till the ends ? Thanks, Pratibha! Really happy you liked this. Its one of our favorite products as well. In the latest label, we have mentioned its not suitable for oiled hair and that large quantities may cause dryness. Also have renamed it Cleanser and Conditioner – its very suitable for use on skin as well, removes toxins. 🙂 Thank you for stopping by Rafi! Yes, I think cleanser is an apt term in comparison to shampoo! Because I think one associates shampoo with lather that does not happen with this product. That’s really an interesting product, had never heard of a mud shampoo before though I know of people using Multani Mitti as a skin and hair cleanser. I read through all the comments above. For Dandruff problem and any scalp infections, try out Cassia as a hair mask, that will condition your hair as well as treat any skin infections. And essential oils also work great for Dandruff. Hi Gaganpreet ! 🙂 If Iam not wrong , Cassia Obovata is neutral henna ? Iam not much familiar with this. It would be great if you could elaborate . I have the dry dandruff issue and this shampoo is not eliminating the dandruff but certainly controlling it. Hi all, by the way, for hairfall – Nirvaaha herbal hair oil is also worth trying. When I moved to Bangalore from Delhi – maybe due to the water quality here I had a lot of hair loss..our hair oil fixed it within just 3-4 applications..
Hi! Have been following the post and comments! To introduce myself am Rafi’s wife and co-founder of Nirvaaha. Thanks for the nice post. :-). I’d like to add something about dandruff and itching scalp. This Aloe-mud Cleanser and Conditioner basically works on the scalp and then through that on the hair. The main ingredients are aloe vera and black soil (soaked several times till it gets completely saturated with aloe vera juice) As most of you know aloe vera is a wonder plant that has antibacterial, antifungal and antiseptic properties, besides healing. Since dandruff is a kind of fungal infection of the scalp it work very well on getting rid of dandruff. Only thing is that it takes time. But it does treat the dandruff from the root. And yes it is best to avoid putting oil in your hair when you have dandruff because the dandruff scales would stick to the scalp and not come out and in fact the fungal infection would increase. So though oiling your hair is a good prevention of dandruff but it is not a cure at all (contrary to popular belief). First you have to get rid of this infection and then start putting oil. Itching scalp also happens due to bacteria and aloevera works best in treating that as well. The black soil literally drinks toxins, impurities and excess oil from the scalp and works as a gentle deep pore cleanser while replenishing the skin with needed nutrients.